Reading page after page of curriculum documents presented in black and white font can inhibit one from easily understanding what a curriculum framework is about and retaining the information required to plan for effective teaching and learning. Harder yet is the task of committing to memory the statements contained within in a certain year/grade level and then quickly trying to ascertain the progression from a related statement from another year/grade level. The Progressive Curriculum Frameworks are the solution to these problems. The Progressive Curriculum Frameworks (which by copyright law must be released for free) are a word-by-word replica of the curricula of various countries that simply contains a colour-coding and physical alignment/augmentation of the related statements from each year/grade level to clearly identify progression/differentiation. Note: The following images can be clicked on to download/view an enlarged/original PDF version. 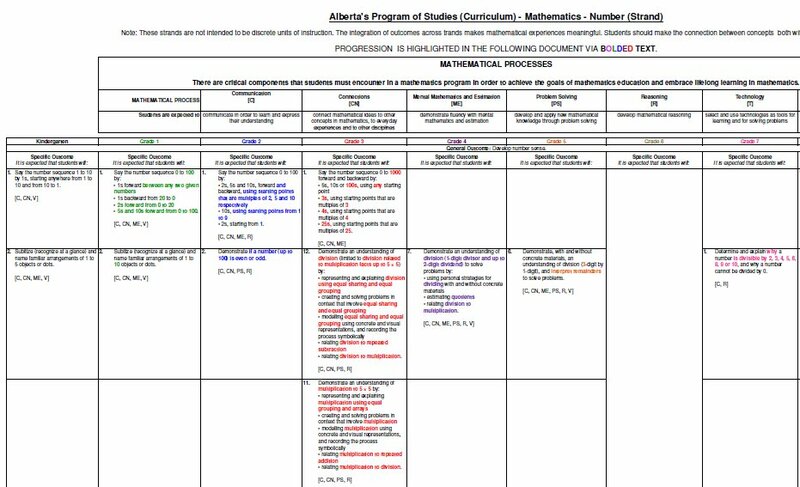 Image 1 (Below): A screenshot of The Progressive Curriculum Framework for the Australian Curriculum: Mathematics - Number & Algebra (Download this framework here or click on the image below). Note the bold words indicate progression/new statements. Coloured font represents each Year level. Image 2 (Below): The Progressive Curriculum Framework for Alberta's Program of Studies - Mathematics K-9: Number. 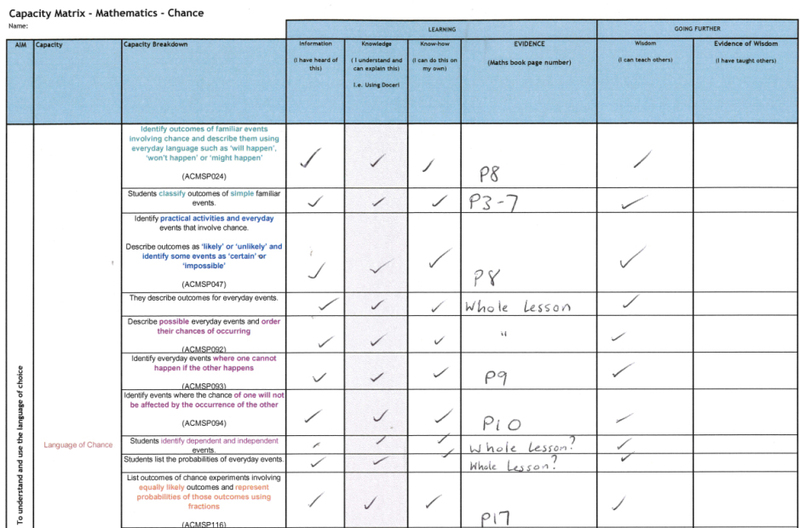 Progression/Differentiation between the specific outcomes is denoted by coloured and bold text. 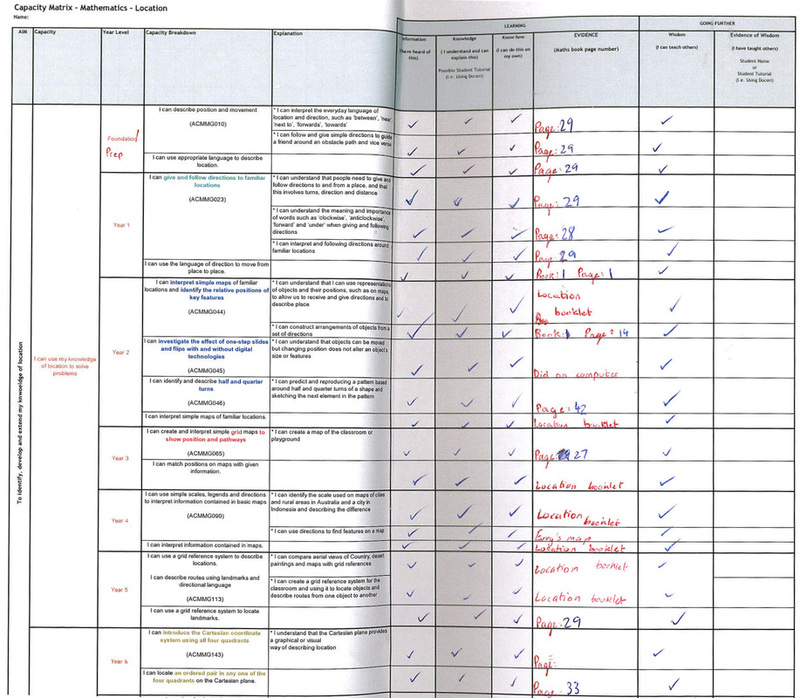 Image 2 (Below): The Progressive Curriculum Framework for England's curriculum (beta and archived). PDF: For printing in A3 colour so that educators can highlight and annotate upon the frameworks by hand or via a computer (with the aide of a PDF editor). Excel: For educators who wish to work directly on a computer to (i) highlight or annotate via or (ii) add hyperlinks (access to the Excel files must be requested via email). The Progressive Frameworks are being used in various schools for a wide variety of teaching and learning practices, including for clearly demonstrating differentiation in planning documents (as pictured below). Click on any of the sub-headings (e.g. Method x) below to learn how to use The Progressive Curriculum Frameworks in a myriad of ways. Curriculum capital: Embracing a school-wide approach to annotating the frameworks to map how each year/grade level within a school meets each of the required curriculum areas. Curriculum planning to show differentiation: Copying and pasting the colour-coded curriculum into curriculum planners to plan and show differentiation. Curriculum﻿ capital: Hyperlinking quality lesson materials that address the areas of the curriculum, essentially creating a school-wide knowledge base containing excellent teaching resources and significantly reducing time spent planning and designing lessons. Creating progressive curriculum documents: Using the ready-made progressive templates and the desired official curriculum documents to easily create progressive curriculum documents. Via computer: If you prefer to use a computer to highlight and annotate what you have taught/what students have achieved, to edit the PDF files download and install Adobe Writer XI (free 30 day trial) or request a copy of the Excel files here. Highlight the statements that been covered thoroughly in green. Highlight the statements that need revisiting in orange. Do not highlight any area that has not yet been taught. Annotate to indicate when it will be taught (e.g. T2, W3). Do not annotate or highlight if the skill is not evident. If the skill has been taught but they did not show any understanding, annotate ‘T’ for taught. Ensure that there is no repetition across the year levels. Quick access for updating during the next unit/reporting period/academic year. The colour-coded curriculum statements contained in any of the Progressive Curriculum Frameworks can be copied and pasted into a teacher's work program (e.g. 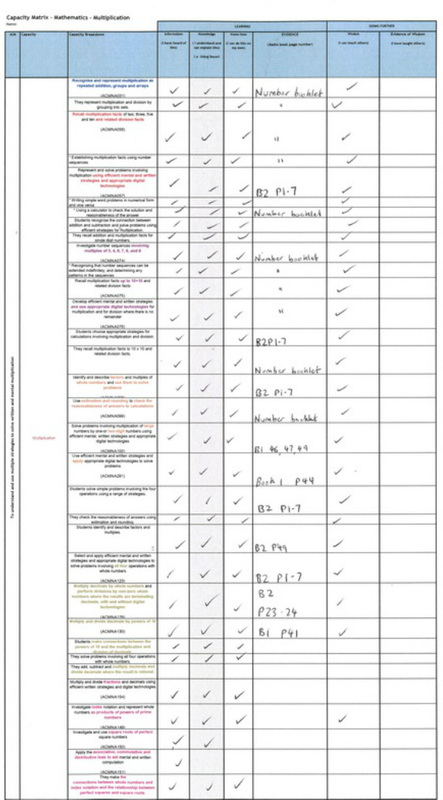 Literacy or Mathematics planner) to show differentiation within a single grade/year level or between multiple grade/year levels (see samples pictured below). Below: The Year 6 content descriptors denote progression (see bold and coloured font) from those statements contained in earlier years. Surprisingly, the 'End of Year 6 Standard' contains no new content (as denoted by the non presence of bold or coloured font). 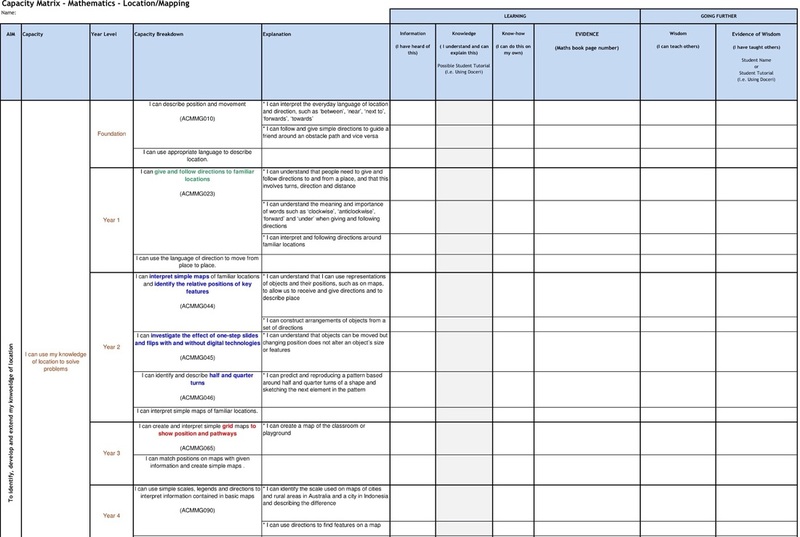 The Progressive Curriculum Frameworks can also be used in conjunction with the following sample unit planner to track student progress through either student or teacher-allocated tasks. Sample Weekly Maths Planner 5 - Differentiation but no use of colour-coded progressive statements. Educators can use any of The Progressive Frameworks to create hyperlinks that navigate to ready-made lessons and activities that have been specifically designed to match the given curriculum areas. These lessons and activities can be teacher or student generated and then stored on school networks, FTP or HTTP servers or cloud-based storage solutions (see the hyperlink pictured right: Data Analysis, Grade 5: Specific Outcome 2). Curriculum Capital - Educators can create hyperlinks to open locations on school-based servers to access quality lesson materials that address each area of the given curriculum, essentially creating 'Curriculum Capital' for the school that any staff member (including graduates and new teachers to the school)can access to achieve excellence in teaching and reduce time spent on curriculum planning and lesson design. Below: When students or teachers click on the content descriptors, a folder open (on either school network drive or via a password protect online server) containing ready-made lessons and activities. 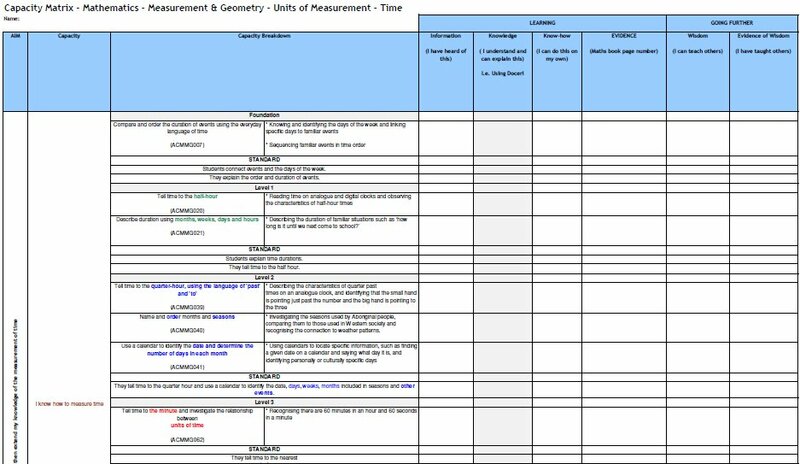 To reduce planning time and increase student choice and engagement, in 2012 I created all lessons and activities for every single content descriptor, elaboration and standard for Mathematics, from Foundation to end of Year 7). The files work on PC, Mac, iOS and Android devices. There are two methods for adding hyperlinks within the Progressive Curriculum Frameworks, (i) Editing PDFs and (ii) Editing Excel files. NOTE: For those attending the InnovateWest session, the ready-made Mathematics lesson and activity files will be provided..
Download and install a PDF Editor such as Adobe Pro XI (free 30 day trial) or the freely available OpenOffice 4.1.0 and the Apache Open Office PDF Editor Plugin 0.1.0. Open the progressive framework using the PDF Editor. Select the required Specific Outcome Number (Canada) or Content Descriptor/Standard (Australia). Add the hyperlink to open a file or a folder contain files specifically design to match the specific area of the curriculum. Test that the hyperlink works by opening the PDF. Repeat steps 4-7 until you have created hyperlinked content for a sufficient amount of the curriculum. Email Effective Curriculum Ideas to access the Excel versions of the relevant Progressive Curriculum Frameworks for your country (attendees at the InnovateWest session will be given the files). Open the progressive framework in Microsoft Excel. Select the required Specific Outcome Number (Canada) or Content Descriptor (Australia). Test that the hyperlink works by clicking on the hyperlink. Note: Whilst Excel files can be saved as PDF, the file conversion process may look like the hyperlink has been saved and transferred into in the PDF file but then nothing happens when users 'click' on the hyperlinks! We have all handed out paper-based test and heard the groan of our students. Paper-based tests also require students to use their reading skills, which in the case of Mathematics tests, may inhibit their ability to demonstrate what is being tested...Mathematics. This no longer need to be the case. Embracing the philosophy behind the QLA Capacity Matrices, educators can copy and paste the content from The Progressive Curriculum Frameworks into Progressive Capacity Matrices. The Progressive Capacity Matrices (below) have been designed using the progression / differentiation colour-coding from The Progressive Curriculum Frameworks. At the beginning of a unit, to both communicate and demonstrate (see the evidence column) that they understand and can complete the required standards/specific outcomes/content descriptors/elaborations/achievement indicators. If a student encounters a statement that they cannot read, the teacher can paraphrase or use synonyms to explain what it means. When students get to a statement in a particular Progressive Capacity Matrix that they do not know/cannot demonstrate, then point of learning/the zone of proximal development has been identified and can be taught to and then extended. As an end of unit task (post-test) to find and state evidence that they have met the applicable standards/content descriptors/elaborations/specific outcomes/achievement indicators. They also have the opportunity to identify when they have taught someone (higher learning), which could also be extended to include a column to record the names of the students who taught them (recognition) and to identify avenues for filming student tutorials for their Interactive ePortfolios. The Progressive Capacity Matrices can be downloaded below in both PDF and their editable Excel format (so that the curriculum statements can be deleted, replaced with the relevant statements for your country's/province's curriculum, or to add hyperlinks to link to online or network-based digital lesson and activity content). Below: A student demonstrates their 'capacity' to perform multiplication. 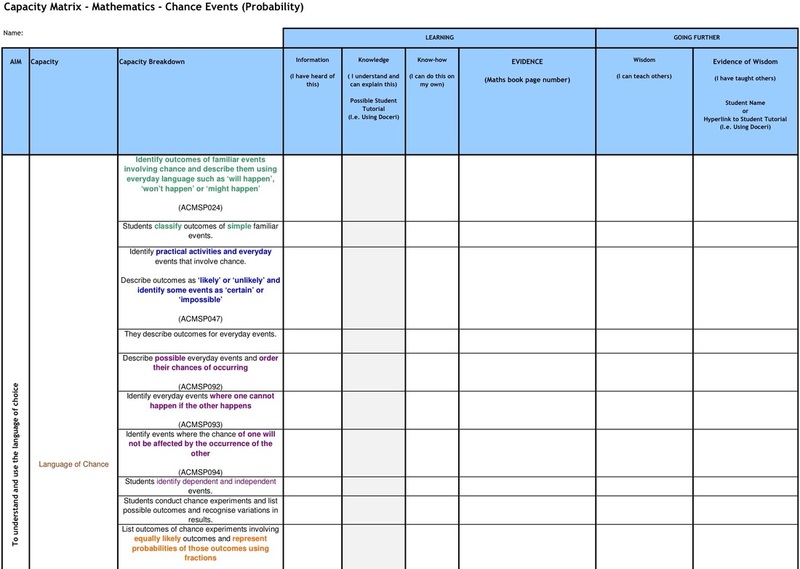 The Progressive Capacity Matrices can also be used in conjunction with the following sample unit planner to track student progress through either student or teacher-allocated tasks. Download the Excel (.xlsx) version of The Progressive Capacity Matrices that best suits your needs (see the relevant sub-headings below). Delete the statements and replace them with those from your own progressive curriculum frameworks. As discussed above, print them on A4/A3 colour and give them to your students as either a replacement to a pre- or post-test, or as a progress tracking tool. Transformation - Progressive Capacity Matrix - Year Level Labels Hidden (.pdf .xlsx). The following section has been provided to allow educators hands-on experience in identifying and highlighting progression in curriculum documents by copying statements verbatim from official curriculum documents and pasting them into a sample progressive framework template. Microsoft Excel with a suitable ready-made template (pictured right). A PDF virtual printer (to save work into PDF form for easy browsing/use by other educators). Download the official Alberta Program of Studies - English Language Arts K-9.pdf or access the online version. Download the Excel version of the template for Alberta's PoS - Identifying Progression in English Language Arts (K-9) - Sample.xlsx. Open Alberta's PoS - Identifying Progression in English Language Arts (K-9).xlsx and navigate to Section 1.2: Clarify and Extend - Combine ideas. Open the official Alberta Program of Studies - English Language Arts K-9.pdf and navigate to page 12 (Section 1.2). * Copy the specific outcomes statements from 'Combine ideas' into the relevant areas of the Alberta's PoS - Identifying Progression in English Language Arts (K-9).xlsx. *NOTE: As text from official curriculum documents normally contains hidden formatting, users may find that it is easy to copy statements directly from the official curriculum documents into a plain text program such as Notepad. Once the statement(s) has been pasted into Notepad, edit the statement(s) to remove further formatting. Copy the statement(s) and paste the content into the desired cell(s) in the Excel template(s) by clicking on a cell and then pressing F2 key on the keyboard and then select Paste. 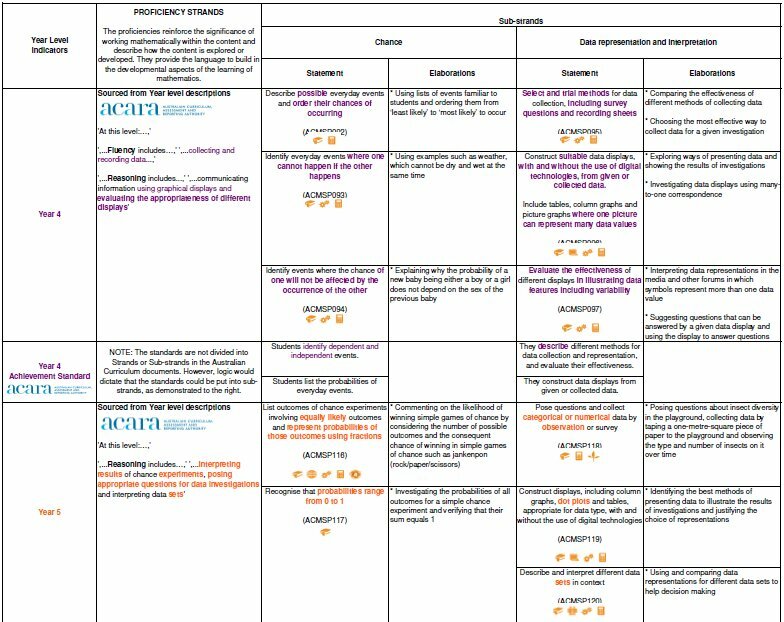 Read each specific outcome statement from 'Combine ideas' and highlight the progression (new vocabulary) using the relevant coloured font and 'bold'. If the computer you are using does not have a PDF printer: Download and install CutePDF Writer. In Excel, click on 'Print', select 'CutePDF Writer' as the printer and press Print. You will then be prompted to save the work as a PDF file. Download the official England Curriculum: English programmes of study: key stages1 and 2National curriculum in England–statutory guidance to July 2015. 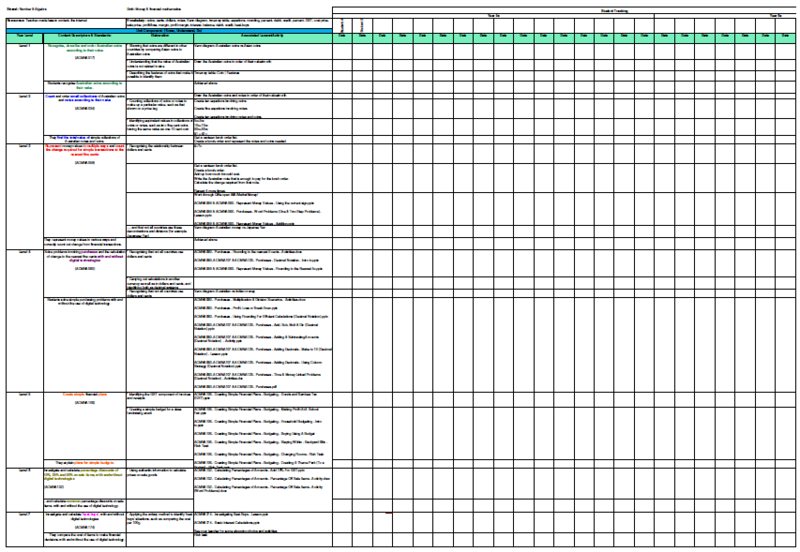 Download the Excel version of the Progressive Template for En3 - Writing - Attainment Targets. Open the official England curriculum and navigate to Page 30. Copy the Attainment Targets for Levels 7 and 8. 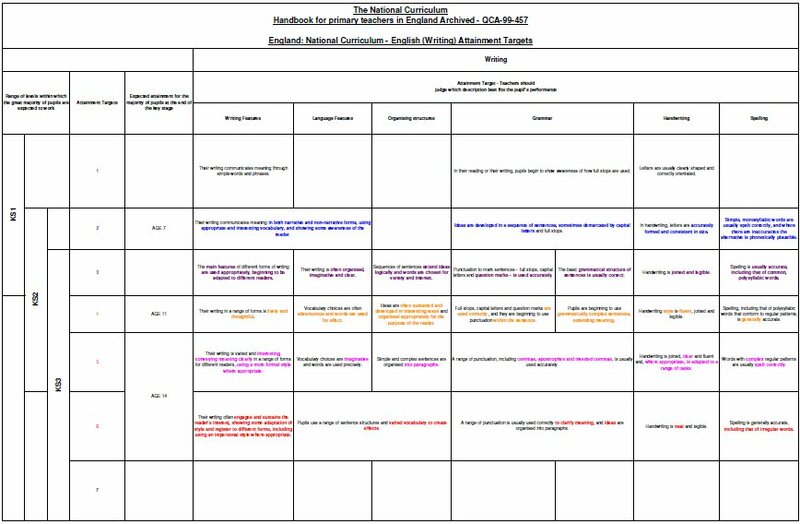 * Paste the sentences contained within the Attainment Targets for Level 7 into the relevant areas of the Progressive Template for En3 - Writing - Attainment Targets. Colour-code the new vocabulary present in the Level 7 statements using the relevant coloured font and 'bold' to show progression from the statements made For Levels 1-6. The Excel templates for The Progressive Curriculum Frameworks for the Australian Curriculum and AusVELSAC are not available for public viewing. Please email Effective Curriculum Ideas to request the files.